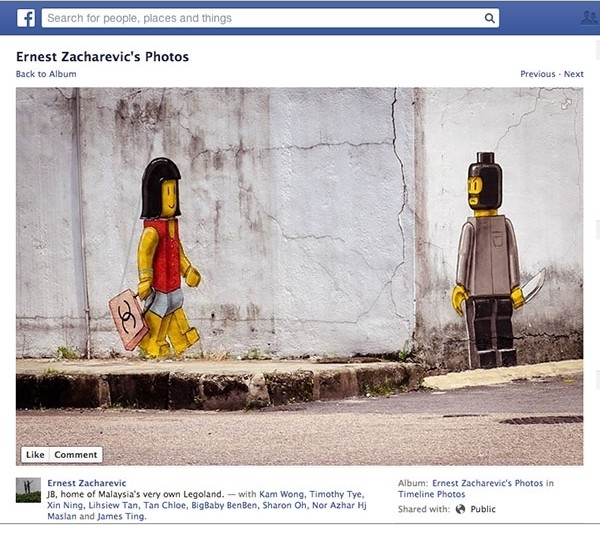 The original mural, shared by Ernest Zacharevic on his Facebook page. 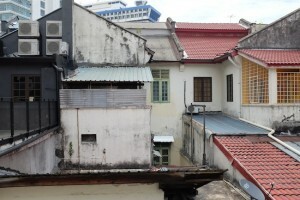 Ernest Zacharevic’s street art has become a fixture in George Town, Penang. His paintings of children on old walls of the city are a regular photo-stop for tourists, and his art has even been bootlegged and made into souvenirs by local hawkers. 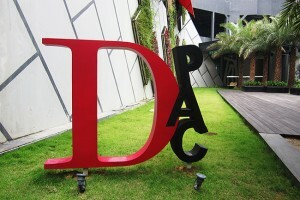 The murals are featured in international publications and art blogs. 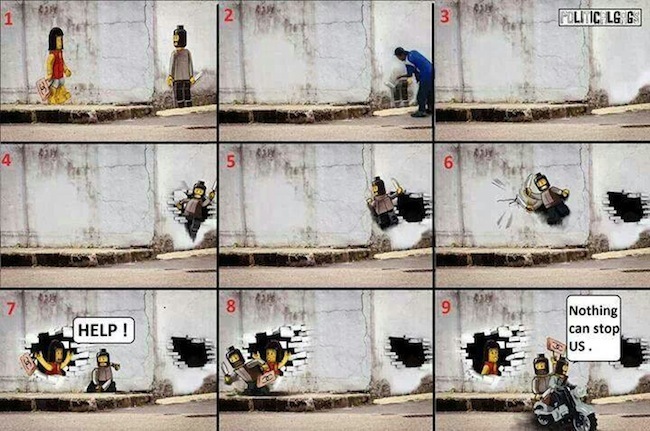 But in Johor Baru, Zacharevic’s art has been less welcome. 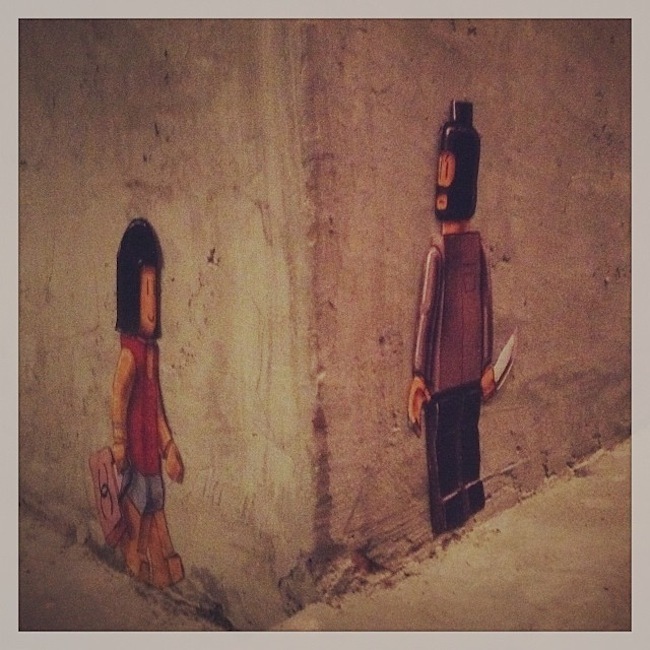 His painting of a lego woman walking towards a lurking lego mugger was painted over by authorities last Wednesday. 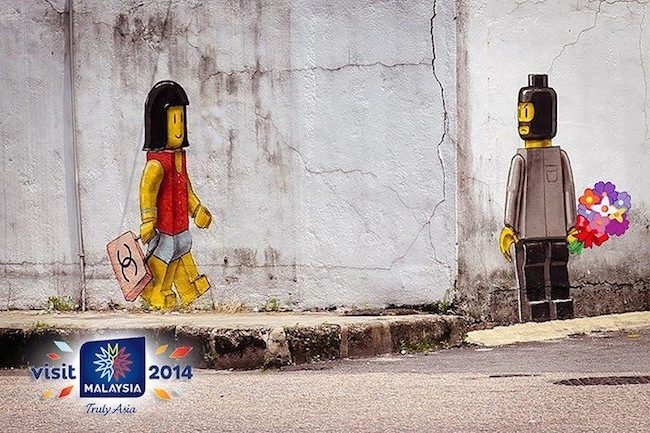 The paintings played on Johor’s reputation for crime and its push to draw tourists to its Legoland theme park – a visual pun not appreciated by city council authorities. The removal has become a saga that has attracted far more attention than the city council could ever have wished. 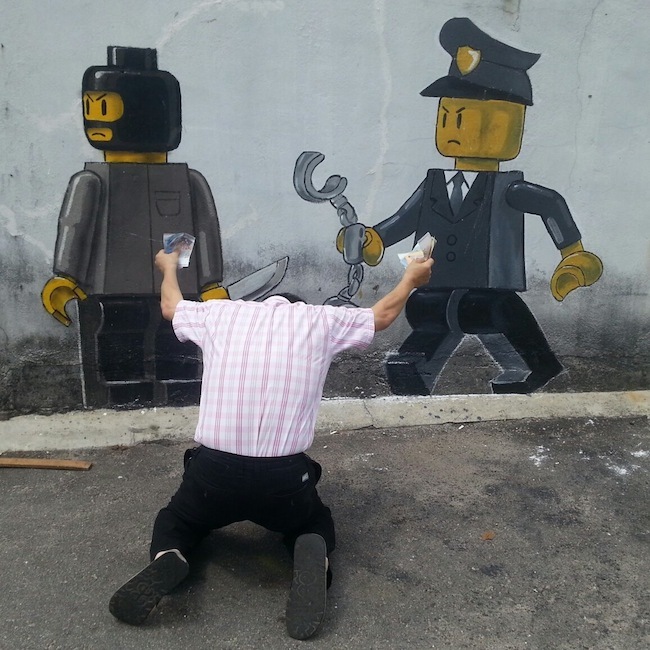 Local artists responded to the decision by adding a lego policeman to the scene. 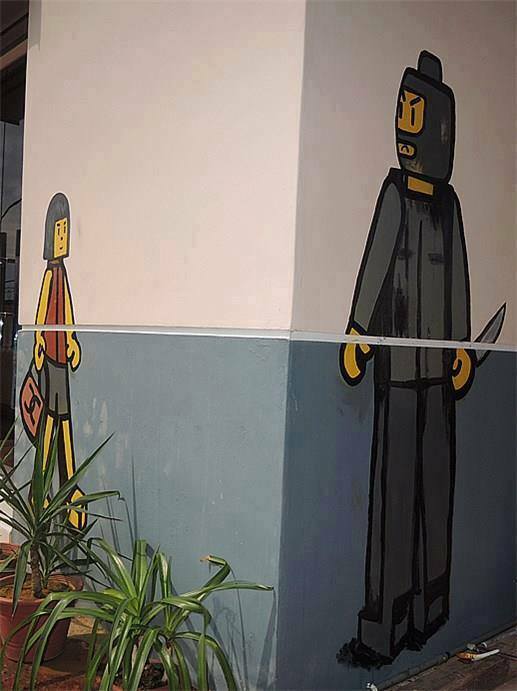 Later, Zacharevic replaced the mugger’s knife with a bunch of flowers, posting it on his Facebook page with the comment “Politically correct version” and a Tourism Malaysia logo. 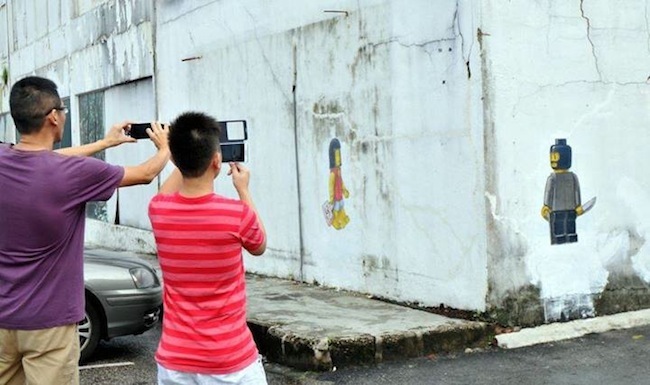 After it was whitewashed, tribute versions popped up in Johor (and even in KL) and the original wall was sticker-bombed with the same characters. There have also been some great memes courtesy of photoshop. It seems that the city council won’t be allowed to forget this mural any time soon. Shared by BL Tay on Facebook. A photoshopped meme on Political Gags. 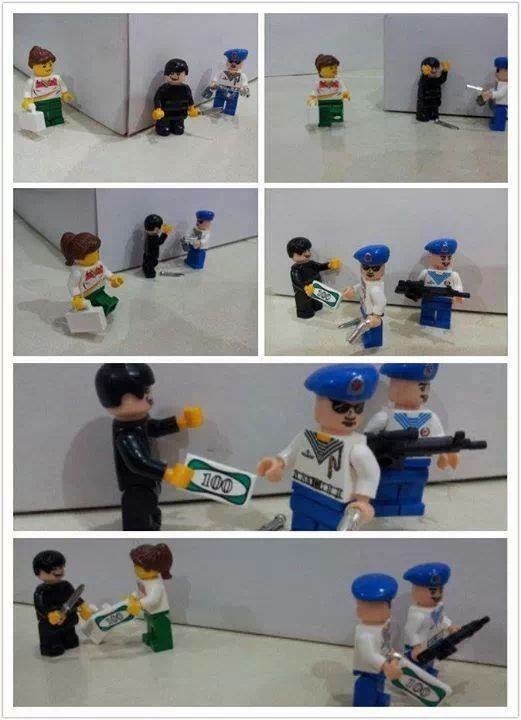 A lego version of the story, shared by Alvin Tham on Facebook. Sticker versions appear. 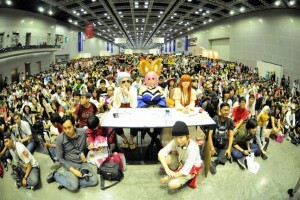 Shared by Says.com. A tribute version on another wall in JB. Shared by Hawkeye Jack on Facebook. 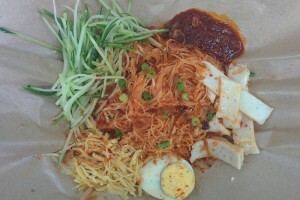 A tribute version in Pickle & Fig café, TTDI, KL. Shared by Kakiseni on Facebook.